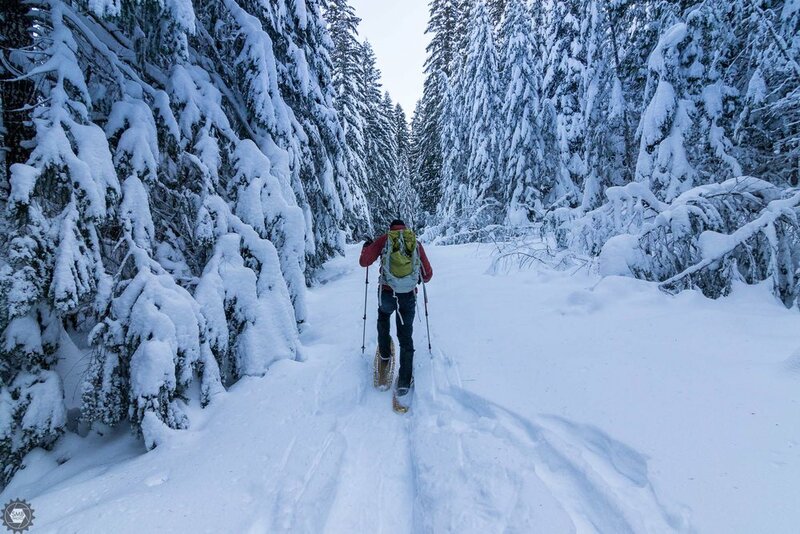 While Portland is known for it's rain and proximity to mountains, it's not known for snow. This year we had a 20-year storm that dumped 12 inches on the city. While that is fun and all, it means the lower mountains got pummeled with 3 feet or more of fresh powder. I bought a set of snowshoes last year, but never actually had the opportunity to use them. So I was itching to get out in all this fresh snow. It's not that I haven't been hiking in the snow, but rather that the trails are usually packed down enough that I can get by without them and usually end up carrying them on my backpack. With all the new snow a buddy and I headed out to Falls Creek Falls in Washington to do a little snowshoeing and see a frozen waterfall. In the summer, the parking lot for this trail is pretty close to the falls, within 2 miles, but in the winter the forest road is closed so there is an additional 2-mile hike just to get to the trailhead. We headed out early, knowing that it would be cold. On the way there the thermometer in the car kept dropping. It started in the 20s then fell into the teens and then it hit 1 degree. We figured that it would be a very interesting day. As we got closer to the forest road where the hike would start we ran into "Road Closed" signs. It turned out that the road was closed about a mile from where we had planned on starting. The 8-mile snowshoe trip sounded long enough to start, and tacking on an additional mile each way looked to result in a very long day. Good news is that the temp jumped up to a balmy 6 degrees as we started our hike. The start of the hike was up a groomed road, which wasn't too bad. 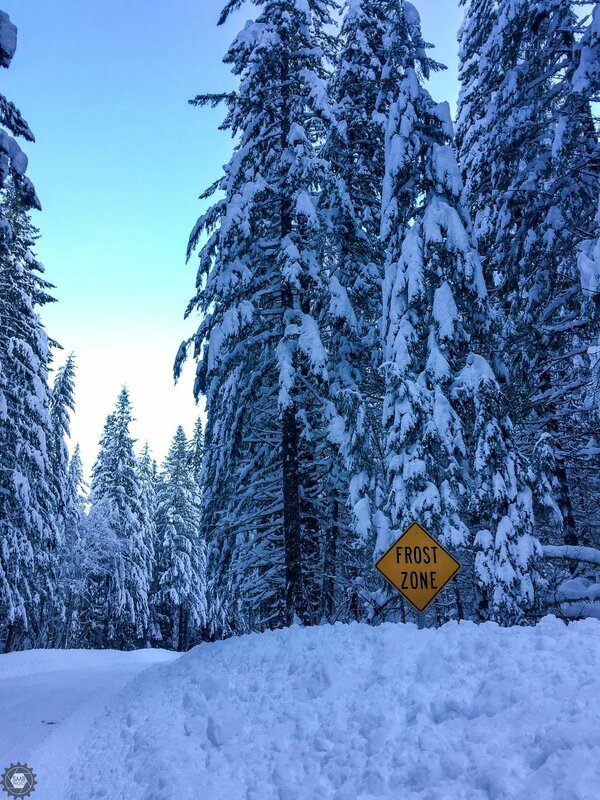 When we hit the forest road we had to scale a 6-foot snow berm to get to the wonderland of fresh powder. Luckily we weren't the first ones to have been on the road and there was a light trail for us to follow. I don't know if we would have made it to the falls if we had to break trail, in three feet of powder, the whole way. The forest road was a beautiful walk though flocked trees. Miles of beautiful snow and quiet that only a blanket of fresh powder can bring. After a few miles the view opened on the expansive trailhead parking lot. It actually seems small in summer, but it gave us a dramatic approach to the trailhead. Once on the actual trail the going got much tougher. We had to climb over and around multiple downed trees along a ridge above a partially frozen river. The trail is plenty wide in the summer, but with snow and the potential for sliding into frozen water it felt much more adventurous this time. The last half mile to the falls was quite a climb and we both ended up ditching the heavy gloves and unzipping our jackets to cool off. That seems a little funny when the temps were probably in the 15 degree range by then. The falls were spectacular. I've never seen so much ice in my life. It was actually a little difficult to tell what was frozen and what was moving. Everything was white – so many shades of white. We took a few pictures at the top, had some hot beverages and lunch before heading back to the car. To put the temps in perspective the water bottle in my backpack froze and my sandwich had ice crystals all over it. My camera lens froze up and took a while to clear the ice film off the lens. All-in-all the hike was slightly over 10 miles and took more than 5 hours. I would safely classify this as an epic adventure. Plus, I can check off the first successful use of my snowshoes. See more images from the trip below.